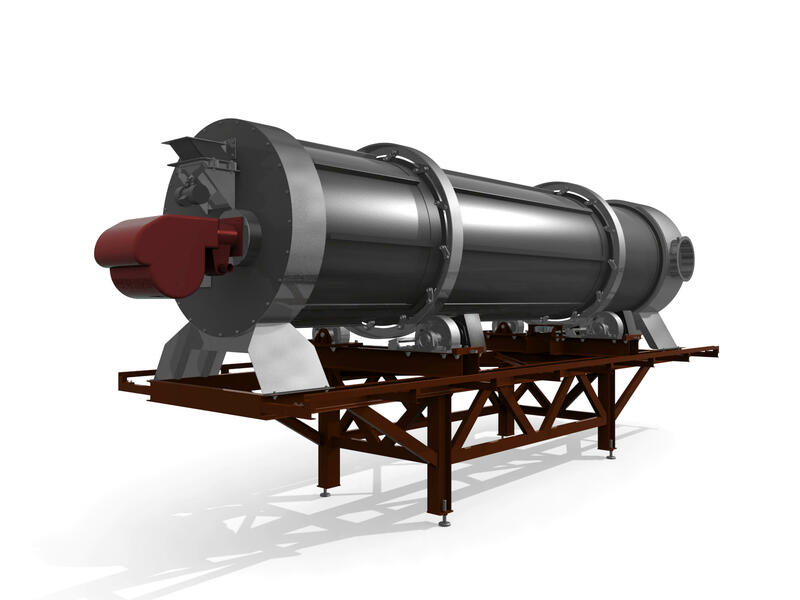 The revolv­ing drum dryer has been designed for drying of loose or lump mate­ri­als, such as sand, ceramic frits or crushed cullet, with mixture of flue gases with air. The drying process is con­tin­u­ous. The wet mate­r­ial is fed in the drum dryer via a chute in the dryer inlet section. A uniform dis­tri­b­u­tion of the mate­r­ial in the dryer is guar­an­teed by the inside paddles, arranged con­ve­niently in a zig-zag pattern. The pushing auger paddles move the mate­ri­als inside the drum from the feeding to the dis­charge section. The flow rate of the mate­r­ial can be con­trolled by varying the slope and rev­o­lu­tions of the drum. Dry mate­r­ial leaves the revolv­ing drum through the outlet chute. The flue gases are mixed with air in a com­bus­tion chamber of the auto­matic gas burner, pro­vid­ing thus suf­fi­cient quan­tity of the heat carrier. The required tem­per­a­ture of the heat carrier can be con­trolled by adjust­ing both the amount of air passing through and output of the burner. The used heat carrier mixed with dust frac­tions of the dried mate­r­ial is exhausted in the air-exhaust system mounted to the upper opening of the dryer. The drum rotates on two pairs of sup­port­ing rollers. The driving rollers are arranged in a common axis on that side of the drum that is more loaded, and each of them is driven with a worm gear unit and the elec­tric motor. The drum rev­o­lu­tions can be set con­tin­u­ously with a fre­quency con­verter that con­trols the rev­o­lu­tions of the motors in the gear units. The drum and all the dryer sec­tions coming in contact with the dried mate­r­ial are made of alloyed stain­less steel.